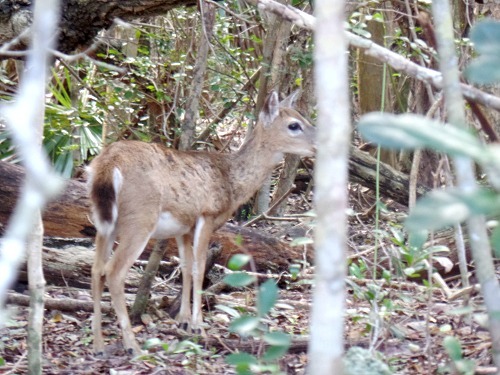 The tiny, friendly key deer, and the Blue Hole, a freshwater wildlife magnet, are two popular tourist attractions found at Big Pine Key just south of Marathon FL. Located in the National Key Deer Refuge, this freshwater 'lake' was a byproduct of the construction of the Henry Flagler Railroad. The quarry is filled with life giving fresh water derived from the frequent rains, and a foundation of saltwater that filters through the limestone bed. With the freshwater having greater buoyancy, it's able to float on top of the denser, larger quantity of saltwater. 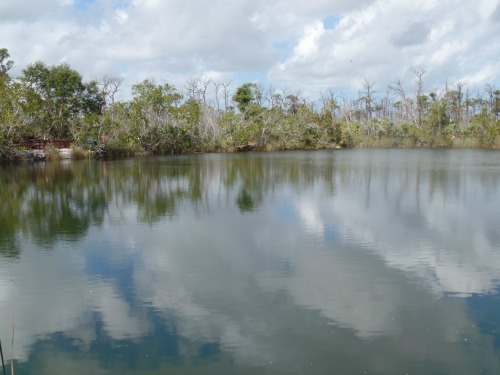 This allows the two layers two remain relatively separate and is why the quarry serves as a vital life source for a broad spectrum of fish, reptiles, birds, animals, and specifically the key deer. A big part of a visit to Big Pine Key and the National Key Deer Refuge are the gentle key deer. However even more Florida nature can be enjoyed by a visit to the Hole coupled with a short walk on the .7 mile Nature Trail and the .1 mile handicapped accessible Mannillo spur. 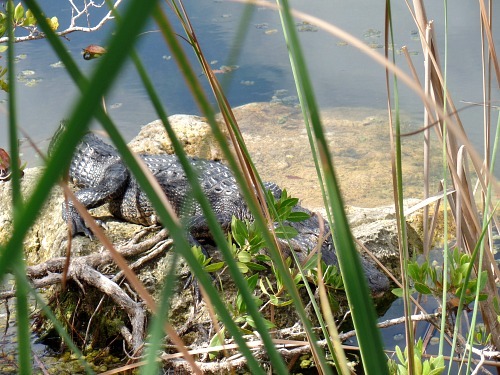 The Hole is the perfect destination for Florida wildlife watching, and from the observation platform, it's easy to enjoy and photograph one of the major drawing cards of the Blue Hole, the American alligator. Unlike the crocodile, alligators live in fresh water with occasional sojourns into brackish water. However, in the Florida Keys sizable freshwater is a relatively rare commodity. This makes the Hole the idyllic viewing point to enjoy one of Florida's signature species. 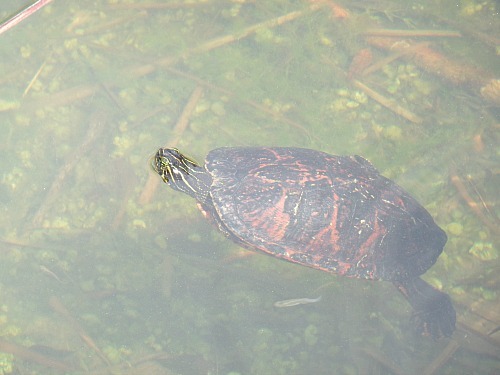 Apart from the slowly growing number of alligator who call this freshwater pond home, you can expect to view different species of turtles, lizards, snakes, and frogs. The area is also home to a variety of birds including numerous species of hawks, American bald eagles, ospreys, kingfishers, anhingas, green herons, egrets, a variety of doves and woodpeckers, plus the ever present flocks of redwing blackbirds and the occasional cardinal. 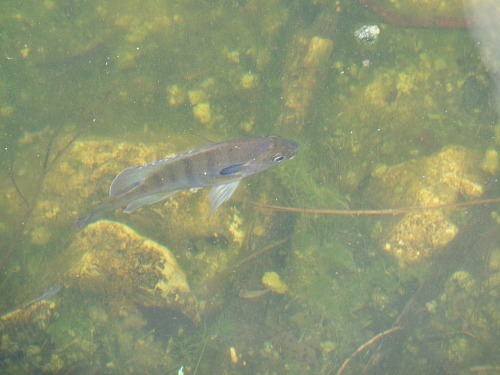 The lake is also filled with a variety of smaller fish, but uniquely, is also home to several species of Florida saltwater fish. This is due to the strong storm surge resulting from Wilma, a powerful 2005 Florida Keys Hurricane which displaced ocean fish into the Blue Hole. Even though the storm surge from Hurricane Wilma would have deposited a number of different types of saltwater fish into the lake, the few species that have survived their years in freshwater are actually thriving. These fish include barracuda and mangrove snapper, plus tarpon and yellow tail mojarras, two fish that are capable of tolerating both freshwater and saltwater. 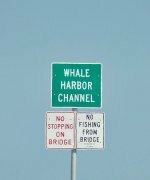 If you're in the Marathon Keys or Key West FL and you're a nature lover, plan on including a trip to the Blue Hole and a walk on the nearby hiking trails. The key to enjoying your visit to these Florida Keys attractions on Big Pine Key is to take your time. Remember you're in the Florida wilderness, not a zoo. Nature operates on it's own schedule and wildlife don't conveniently line up so you can easily see them. Bring your cameras, your binoculars, hats, sun screen and mosquito repellent, then plan on spending a leisurely hour or two. If you do, you'll be surprised by how much Florida wildlife you'll be able to document. 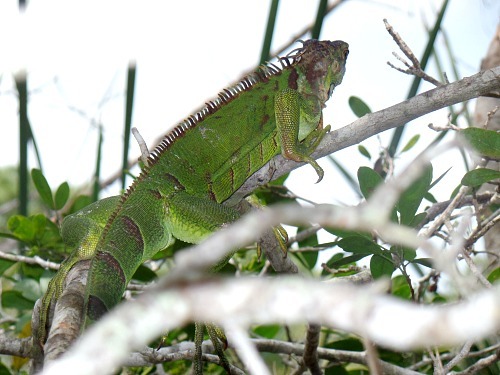 You may even spot an iguana, just one of the invasive species that inhabit this area. The water, trees and bushes act as cover for a multitude of residents, it's up to you to be patient, keep a watchful eye and spot the often tiny miracles of nature around you. Two important mantras not to forget are Don't Feed The Wildlife and Don't Litter. Often the items people leave behind, end up killing the very wildlife they came to enjoy. While you're enjoying this natural part of Florida, also think of Henry Flagler. Not only was he visionary in building his railroad and connecting Key West FL to the rest of the world, he ended up providing a life giving supply of freshwater to the key deer and other wild inhabitants of the Florida Keys living in and around the Blue Hole.